Located on Cibaduyut Street, about 30-minute drive (depending on traffic) from the heart of the city of Bandung. the statue of two giant bronze shoes at the street entrance suggests what the center is selling: various kinds of shoes, both made up of leather or synthetic materials, handmade or factory-made. From boots to dress shoes and from high-tops to athletic shoes, you can find all sorts and sizes here at economical prices, yet with good quality. between Rp 150,000-Rp 300,000 (about US$15-30) per pair. Some shops also offer sandals, leather bags, belts, and leather jackets, also`at bargain prices. The shoe industry in Cibaduyut started in the 19205 by several local people, who initially worked at a shoe factory in Bandung, but after gaining skills they opened up their own shoe-making business. For years, the shoe-making crafts have been transferred from one generation to another generation. Thereare now an estimated of more than 500 cobblers in the Cibaduyut area. The industry experienced a golden age between the 1985 and mid-1995, when footwear products from Cibaduyut were exported to as far as the Middle East, Africa and the Netherlands. The government in 1989 declared Cibaduyut as one of the country’s tourist objects. 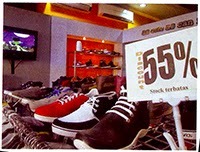 However, following the late 1997 Southeast Asia financial crisis, the Cibaduyut shoe industry started to decline as the plunge in the value of the rupiah against the US dollar had made the cost of raw materials import more expensive, causing some shoemakers to be unable to cover the cost, and subsequently collapsed. Several years ago, the Cibaduyut footwear industry started to recover again, with successive top central and local government officials vowing to help the industry to further develop including last year’s promise by Minister of Industry to bring in Italian shoe designers to further bolster the quality and popularity of Cibaduyut footwear products both at home and overseas. According to one estimate, the Cibaduyut shoe center last year booked a turnover of more than Rp 27 billion a month , or up about 10 percent from some Rp 25 billion in the previous year. Focus on local market Despite its potential for export, the shoe makers in Cibaduyut are still focused on catering to local demand, which accounts for about 98 percent of the shoe center’s overall market, with customers not only in Java, but also in as far as Sumatra, Kalimantan, Sulawesi, and Papua. One local Manager footwear brands including Garsel, Garucci, and Gareu, said his company is still focused on the local market because it’s a huge market, with demand for Cibaduyut shoes remains strong. “We’re currently stilt focused on the local market. The demand every year keeps increasing,” he said. He acknowledged that in the past his company exported some shoes to markets in Austratia, Dubai, and a few countries in Africa, but the export has been reduced as it prefers on meeting local demand. “The increasing number of the country’s population ever year is already quite promising for us. That’s why we put priority on the local market because it’s quite attractive,” He said. While producing shoes in large number with machine at his factory to meet growing demand,also maintains the manual production process to maintain the unique Cibaduyut handmade shoes as well as to help economically empower the local shoe craftsmen. He said that in addition to employing 40 people at the factory, his company also has been engaged in cooperation with about 500 local cobblers. Marketing Supervisor for the Garucci brand, Ade Fazrin said that the brand now has about 3,000 resellers, who mostly buy the shoes. He said that for any brand, the largest demand is for men shoes, both made up of leather or synthetic material. Some of the materials are still imported, He said, due to the limited supply at home. The production of a particular shoe model of his brand could reach 120 pairs per week. He claimed that sales of the Garucci brand shoes have been rising every year, with sales volume last year reaching more than 60,000 pairs. shoes once a year, it is currently developing premium products, whose model will be updated every three months. 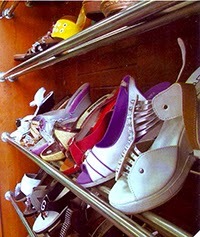 Have an enjoyable shoe shopping in Cibaduyut. Punclut Area, Bandung, West Java, Indonesia – Travel & Leisure. Eating & Drinking in Horror at Bandung, West Java, Indonesia – Travel & Leisure.